For many employees, identifying and then taking the necessary steps to be ready for retirement is a crucial need. But for some individuals, this requires going beyond increased 401(k) savings or optimized asset allocations—to actually stabilizing their financial foundation. Fortunately, financial wellness solutions can be used to do just that. Here, we’ll discuss how to help plan sponsor clients evaluate financial wellness solutions, and we’ll start by looking at exactly why these solutions are so important. To understand why financial wellness solutions are necessary, you need only look at the statistics on the financial stress being carried by many employees. The “Report on the Economic Well-Being of U.S. Households in 2015” found that 46 percent of adults either could not cover an emergency expense of $400 or would cover it by selling something or borrowing money. These numbers speak to the likelihood that these individuals will take loans from their workplace retirement plan or minimize or eliminate their retirement savings, thereby reducing the likelihood of retiring on time. And for employers? Financial stress could mean lost productivity and increased expenses. Given such financial stress, reaching retirement savings goals can be a challenge for employees who are saddled with debt or forced to take loans from their 401(k)s to cover emergencies. Plus, many employees lack financial knowledge in these foundational areas and don’t know where to begin when it comes to making improvements. Providing employees with topical information can certainly help, but it doesn’t always drive them to action. Financial wellness solutions, on the other hand, can help them take the next step and change their financial behaviors. These solutions seek to improve employees’ financial behaviors by providing engaging content, personalized next steps, and easy-to-use tools. Let’s take a closer look at specific attributes to look for when evaluating these solutions. Helping people create a sound retirement plan is critical, but without helping them with their short-term financial challenges, such as growing debt, a lack of emergency savings, or a budget deficit, it’s [nearly impossible] to help someone improve his financial life. The guidance and the counsel we provide for a retirement account becomes much less relevant if we’re not looking holistically at the entire financial picture. To back up these words, AFS 401(k) Retirement Services launched its own online solution, MoneyNav, where participants can find reliable answers to their financial questions and access tools designed to meet a wide range of preferences. 2) Engaging. If employees aren’t engaged, they’re not likely to retain information or change their financial behaviors. 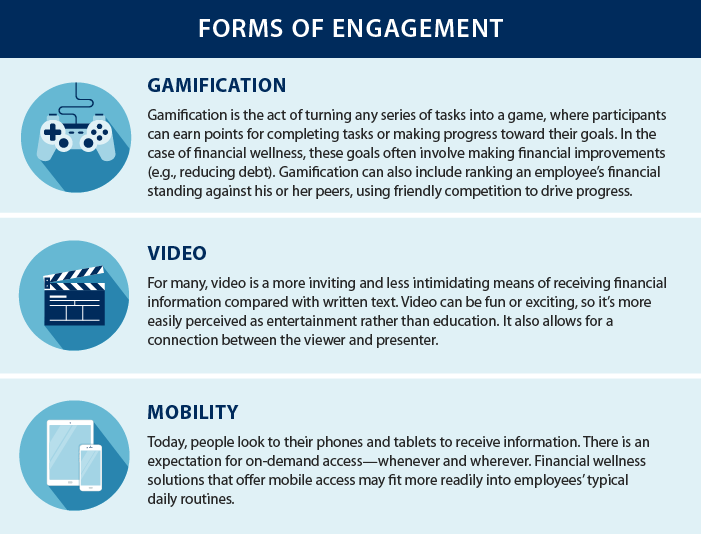 Financial wellness solutions help make these discussions more engaging and keep employees interested and invested (see Forms of Engagement below). 3) Personalized. A financial wellness solution should feel tailored to the individual employee: The information, next steps, and goals presented should align with an individual employee’s specific needs. Personalized information makes a stronger connection with the employee, increasing the likelihood that he or she will successfully change behaviors. 4) Actionable. Changing saving and spending behaviors is not easy—even some of the best financial wellness solutions struggle in this area. Education can be engaging and personalized, but if it doesn’t drive action, nothing will be accomplished. Wherever possible, messaging should be built around attainable next steps to increase the likelihood of an employee continuing the journey. What’s one of the best ways for a financial wellness solution to drive employee action? Guiding the employee toward a professional financial advisor. 5) Measurable. 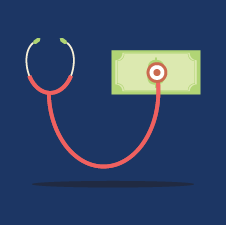 Measurable aspects help show if employee financial conditions are improving and, in turn, help employers validate the financial wellness benefit. This aspect varies widely across solutions. Some measure and rank employee interest in specific topics, some monitor a wellness score, and others measure progress on saving and debt levels. Knowing how success is defined will distinguish which metrics are necessary. Consider this: According to the 2016 MassMutual Benefits Advice Study, 48 percent of advisor-supported firms promote financial well-being for their employees compared with just 33 percent of non-advisor-supported firms. Once your plan sponsor clients decide on the solution that fits their needs, your role is to ensure its success. You can help do this by focusing on the fundamentals. Key attributes. Exploring financial wellness is high on the agenda of many employers, but the solutions can vary greatly. Help your plan sponsor clients evaluate these solutions by educating them on their benefits and some of the key attributes they need to consider. Employee needs. Sponsors should look for a solution that meets their employees’ needs. You can help your clients evaluate employee demographics and determine how to best reach different groups. For instance, millennials may respond better to mobile-friendly solutions offering tools for monthly budgeting, while older employees might prefer on-demand estate planning videos that they can watch from the comfort of home. Financial wellness champion. A champion for financial wellness is an individual who will immerse himself or herself in helping colleagues understand the benefits of sound financial foundations. Whether the appointed person is an HR representative or an employee with a passion for personal improvement, it doesn’t matter—as long as that person is accessible and a believer in the cause. Of course, 401(k) plans and asset allocations remain vital for helping employees save for retirement. But financial wellness solutions can also serve an important role—encouraging employees to engage, change behaviors, and take the next step toward retirement readiness. Have you helped your plan sponsor clients evaluate financial wellness solutions? What other attributes do you look for in these solutions? Please share your thoughts with us below!